Having desserts for no reason is the real happiness.This caramel custard is one easy tasty recipe liked by all ages. It’s a very simple dessert very commonly made at our homes and in a way its a healthy recipe too. We can use an oven to make this but making it in a pressure cooker or simple steaming method may be easy for many. If doing in oven you have to prepare a water bath with boiling water,so that the steam will help the pudding to cook. Any oven proof basin that can hold the ramekins or mould will be perfect one to bake the pudding. Whichever method you follow the taste will be the same toothsome piece of divines s. As we are using vanilla essence the eggy smell will not be there. 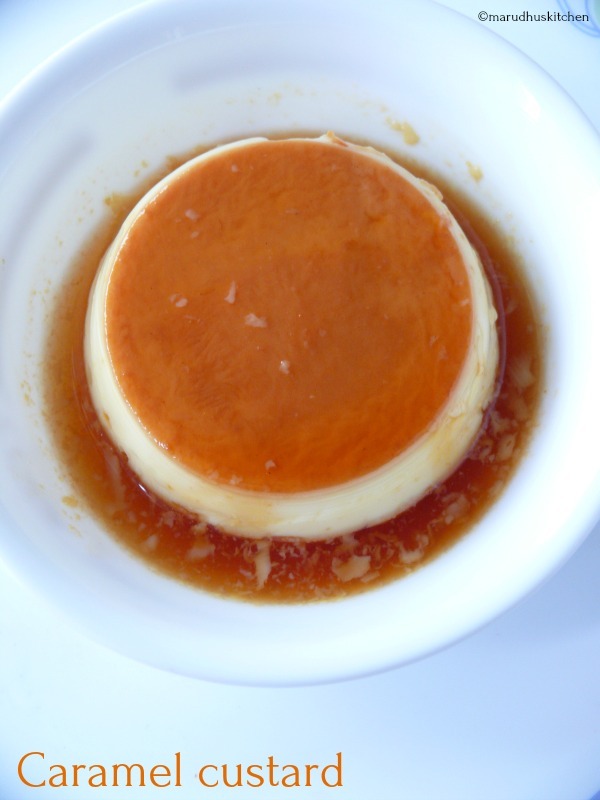 Again coming to oven temperatures it depends on the nature of your own oven and you have to be well adapted to that settings.This caramel custard easy recipe is excellent that every one should try. 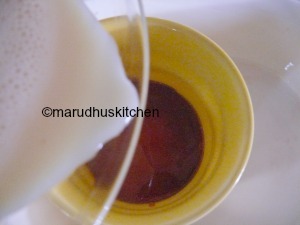 I have used ordinary cows milk, you can use creamed milk for more richness and taste. 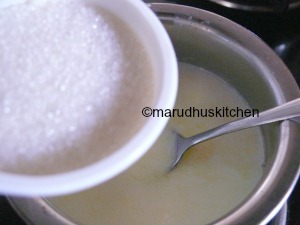 1.First boil milk and when it boils add sugar to dissolve and let it cool. 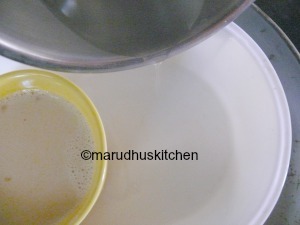 2.Now lets prepare caramel by taking a thick pan with sugar. 3.Sprinkle some water and let it boil and no need to stir. 4.When it reaches the hard crack stage or when it changes colour to dark brown. 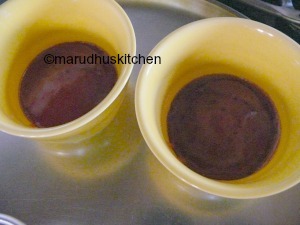 5.Switch off and transfer it to suitable ramekin bowls and leave them to cool. 6.It will set in just 10 minutes. 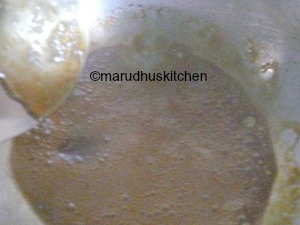 7.In-between beat eggs with vanilla extract and add this with cooled milk mixture and again beat well to combine. 8.Filter these through a sieve to be free from eggy lumps. 9.Pour this into the ramekin moulds with cooled caramel. 10.In-between pre-heat the oven at 180 degree centigrade. 11.Take a oven proof dish that will accommodate these ramekin moulds. 12.Pour some boiling water to half level and place these moulds in there. 13.Now carefully place this in the oven and bake them for 40 minutes or till its well cooked. 14.Top will be browned when cooked. 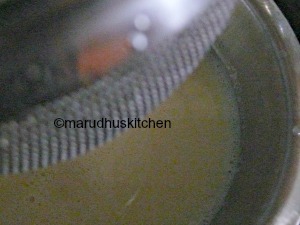 15.After it cools down you can demold it to suitable serving dish and enjoy warm or cold. First boil milk and when it boils add sugar to dissolve and let it cool. Now lets prepare caramel by taking a thick pan with sugar. Sprinkle some water and let it boil and no need to stir. When it reaches the hard crack stage or when it changes colour to dark brown. Switch off and transfer it to suitable ramekin bowls and leave them to cool. It will set in just 10 minutes. 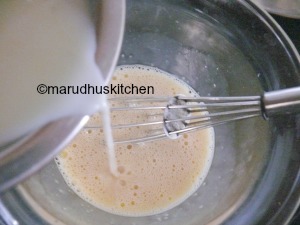 In-between beat eggs with vanilla extract and add this to cooled milk mixture and again beat well to combine. Filter these through a sieve to be free from eggy lumps. Pour this into the ramekin moulds with cooled caramel. In-between pre-heat the oven at 180 degree centigrade. Take a oven proof dish that will accommodate these ramekin moulds. Pour some boiling water to half level and place these mould in there. Now carefully place this in the oven and bake them for 40 minutes or till its well cooked. Top will be browned when cooked. After it cools down you can demold it to suitable serving dish and enjoy warm or cold. To check for doneness you can slightly move the sides of the content,if it is firm then you can confirm its cooked. When not cooked the milk will ooze from inside. Temperature setting differs between ovens. Don’t over brown the caramel as it will become bitter. You can serve this either warm or cold. You can even use steaming method if you are doing it on stove top.